Want to look like a trend setter without having to spend a millions dollars to do so? I've got the best trick on how to do this. It's all about shopping at the right stores. I have to admit, I used to be a bit of a label snob (contemporary that is, as designer labels were out of my reach). If it wasn't a brand that was sold at Bloomingdale's, I wouldn't buy it, and places like Forever 21, forget about it! However, since I stopped working to become a stay at home mom, and started to grow this blog, I have given high street/mass market stores a second chance, and have become pretty good at budget shopping. Don't get me wrong, I still like to buy better quality clothing when it comes to classics such as jeans, and I'll never stop adding Equipment blouses to my collection. But now when it comes to trendy pieces, I like to save my money. There are quite a few stores out there that make beautiful pieces that are on trend and sell for under $50. The key is to know what stores, which products to choose at those stores, and how to style those pieces. If your wearing an inexpensive top, and pair it with designer jeans or a classic bag, it is going to make the top look more expensive. Also, if it fits well, it is automatically going to look like a higher quality piece. So I'm sharing with you five of the best budget friendly stores. There are other great stores out there such as Misguided, H&M, and Zara but these are the ones I personally shop the most. 1. Chicwish: If you've been following this blog for even a couple of months, you know I'm a HUGE fan of Chicwish. I'll be straight forward in saying the pieces that I wear on this blog are gifted to me, but that just makes it even better, as it has become one of my favorite places to shop. The quality is great, the prices are right, and they offer the best selection of tops, dresses and skirts. 2. SheIn: I recently started shopping at SheIn, and have to say all their pieces are on trend and really affordable. It's the perfect online site for buying super trendy items without wanting to make an investment. 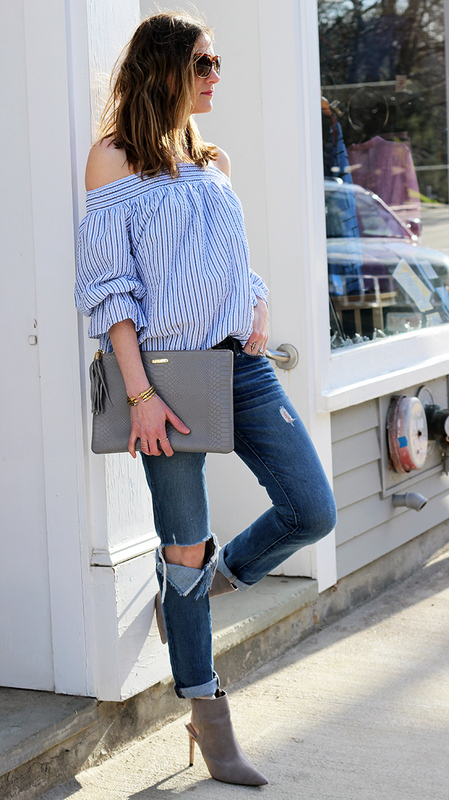 I'm in love with the off the shoulder Tibi dupe that I'm wearing in the photo above, and know that this store is a go-to for many fashion bloggers. I do have to say buyer beware, as you get what you pay for. If the shirt is only $12, it's mostly likely going to feel like $12. I have received an item that I was unhappy with, but for the most part I know what I'm getting, and know what to pair it with to make it look more expensive. My tip for choosing the right items is to read the reviews. They are pretty straight forward in letting you know the fit and quality of the product, and I always use them as my trusty guide when shopping the site. 3. Nordstrom: I know what you're thinking, Nordstrom? They sell designer items. However, a lot of the products they sell are quite affordable and under $100. I love their BP line, and am also a fan of Wayf and Topshop, which they always carry a great selection of. Plus Nordstrom has AMAZING sales, and currently have so many summer items discounted! 4. Forever 21: I'm still getting over the fact that I love Forever 21. It was less than a year ago that I refused to step foot into the store, and now I find my way in every time I'm at the mall. I have to say, I do like shopping online more than in the store, but regardless it has become my go-to. Not only are the clothes inexpensive, but they're on trend. Plus they have been nailing it with their bags. I mostly shop the Contemporary line, as I find the fit to be a little better, and everything has held up pretty well considering the price. It's funny because I always get complimented on my outfit when I'm wearing a piece from Forever 21. 5. Asos: Asos is my go-to when I need to find that perfect dress for any occasion, plus I love their selection of accessories. They have the best shoes, and I can't get enough of the Quay sunglasses. Its a great site for finding on trend items, and to my pregnant friends/readers, they have an awesome maternity section. Tell me, what are your favorite stores when it comes to budget shopping? First off that tan suede skirt is amazing! I love deals as well and Old Navy and Gap are my favs to shop for deals! Thank you Ruth! I also love shopping at Old Navy for great deals! Totally true about Nordstrom, they have some great contemporary items for under $100 and with a good sale, totally affordable! Love all your looks here! Thank you Alice! Nordstrom is one of my favorites! Thank you! Isn't F21 so good lately? I love your picks! I agree with Shein - I've purchased a few times here. And while there are some disappointments, I couldn't really blame them for the price. I knew what I was getting. But now, I've gotten better with some tricks there. Like you, I always read the reviews (preferably with photos) before buying. Thank you Abigail. It can be hit or miss with them, but if you follow the reviews, you're probably going to be happy with the item! I'm obsessed with Chicwish, def check them out! I haven't bought anything from Romwe or GoJane but I do also like Boohoo! I need to try the TJMaxx route again. I hear of so many people finding great things there, but every time I go in, I leave empty handed. I think I go at the wrong times, because I know they sell all the brands I love! These pictures totally look like they could be from a magazine. I don't shop at any of these stores but you make them all look like so high end.